We seem to be on a science kick this week! Believe me, your kids will want to do this more than once. Here is a simple chemistry experiment that you can do with everyone’s favorite baking soda and vinegar reaction! Making a volcano is fun, but did you know that you can also use baking soda and vinegar to blow up a balloon? We used this experiment to learn about gases. 1. Using your funnel pour vinegar into your bottle. You only need to fill about 1/3 of the bottle. 2. Using another (dry) funnel pour baking soda into your balloon. Fill the balloon approx. 1/2 way. 3. 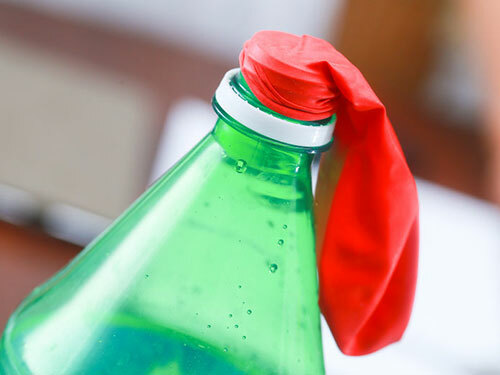 Cover the top of the bottle with you balloon. Make sure you don’t let the baking soda spill into the bottle prematurely. The science behind it – Baking soda and the vinegar create an ACID-BASE reaction. When combined/mixed they create a gas – carbon dioxide. Gasses need room to spread, so the carbon dioxide fills the bottle and then moves into the balloon inflating it.